Prof. Eugene Kandel, former Chairman of the National Economic Council, spoke at the Zuckerman STEM Leadership Symposium. 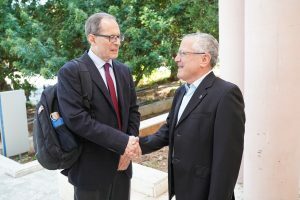 “Israel is a technological success story, but in order to maintain a standing of relevance, we need to grow,” said Prof. Eugene Kandel, former Head of the National Economic Council in the Office of the Prime Minister, at the Technion on November 7th. His lecture was delivered at the annual Zuckerman STEM Leadership Program Symposium, an academic program that aims to enhance the mobility and collaboration of postdoctoral students and research scholars in Israel and in the USA. The Zuckerman STEM Leadership Program, established through a generous $100 million donation by businessman and philanthropist Mortimer Zuckerman, enables American and Israeli researchers to collaborate. This program was established in 2016, following an agreement between the Zuckerman Institute and the four founding Israeli academic institutions: Technion, Hebrew University of Jerusalem, Tel Aviv University and Weizmann Institute of Science. Recently the program was extended to include 3 additional universities: Bar Ilan, Haifa and Ben Gurion. Prof. Shie Mannor of the Viterbi Faculty of Electrical Engineering summarized the current status of artificial intelligence research and Dr. Omry Koren of Bar Ilan University talked about discoveries in the world of microbiome research, bacterial populations that inhabit the human body. Several Zuckerman program fellows spoke about their research including Dr. Joseph Lefkowitz from the Faculty of Aerospace Engineering at Technion, Dr. Tiffany R. Lewis from Haifa University, Dr. Daniel Kagan from Bar Ilan University, Dr. Omri Wurtzel from Tel Aviv University, Dr. Dahlia Perez from the Weizmann Institute of Science, and Dr. Laurel Stephenson Haskins from the Hebrew University.